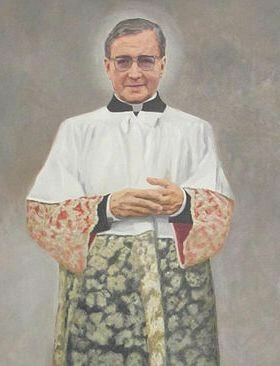 June 26 - Saint Josemaría Escrivá, Priest - Optional Memorial - My Catholic Life! When today’s saint was a young priest he was a rather well known speaker in Madrid, Spain. Besides being an excellent homilist, he also preached retreats, gave parish missions, and taught classes. A young woman heard that Fr. Josemaria was scheduled to give some lectures nearby and, in light of his reputation, was eager to hear him. But first she went to one of his Masses. After that, the woman didn’t want to hear his lecture; instead she wanted to discover God’s will for her life. Saint Josemaria’s example of intense devotion and prayerfulness in saying Mass made her rethink her entire vocation. A good priest disappears into his vocation, submerges himself in Christ, and communicates a divine, not a personal, message. He makes people think of God, not him. At Mass the priest is not himself, yet is fully himself. He performs a sacrament because he is a sacrament. The sacrament of Holy Orders is hidden behind the aspects of a man, the Holy Eucharist behind the aspects of bread and wine. It is the theology of the Church that every sacrament validly performed is efficacious, that it transmits sanctifying grace to the soul. But the fruitfulness of a sacrament for its recipient, either psychologically or spiritually, fluctuates. It can depend on any number of factors, from the beauty of a Church, the quality of a homily, the sacredness of the music, or the intellectual preparation, openness, and ardor of the one receiving the sacrament. A holy, charitable, and educated priest infuses every sacrament he celebrates with a theological meaning that yields spiritual fruit that goes beyond efficaciousness. Saint Josemaria’s writings, preaching, lectures, and talks were so rich, so chock-full of practical purpose and high meaning, that a great international family gathered around him, harvesting from his sustained example and insights an abundant banquet for their spiritual table. Josemaria Escriva was born in a small town in rural Spain. He attended diocesan seminaries in the nearby city of Zaragoza and was ordained a priest in 1925. In 1928 he experienced a vision which spurred him to found Opus Dei, an institution that quickly spread to all the major Christian countries. Opus Dei consists primarily of married lay men and women, while some members are unmarried and consecrated celibates. A few members are priests. After two thousand years of Catholic spirituality, it might be asked what new insight warranted the foundation of a new Church institution? It is a sign of the Church’s theological and spiritual fecundity that Saint Josemaria did offer an innovative, new approach to living as a disciple of Christ in the world. In other words, there is no need for a serious lay Catholic to abandon his work and routine, family life, or everyday relationships to fulfill God’s will. God is found in and through ordinary life. Cardinal Albino Luciani, later Pope John Paul I, perceptively noted that Saint Josemaria was not teaching a ‘spirituality for lay people,’ as Francis de Sales taught, but a ‘lay spirituality.’ It is not a question of praying the rosary while sweeping the floor, or contemplating scripture while driving. It is about “materializing” holiness by converting ordinary, well done work into a sacrifice and prayer to God. Ordinary work, then, is not just the context, but the raw material, for lay holiness. All jobs are important. Daily life is not a distraction from God’s will for us. Daily life is God’s will for us. When we get to work we get to God. Saint Josemaria, may your intercession help us to follow your teachings in making our daily labors divine labors. May our work, well done, mingle with Christ’s work and sacrifice to form one perfect offering in praise of thanksgiving of God the Father.